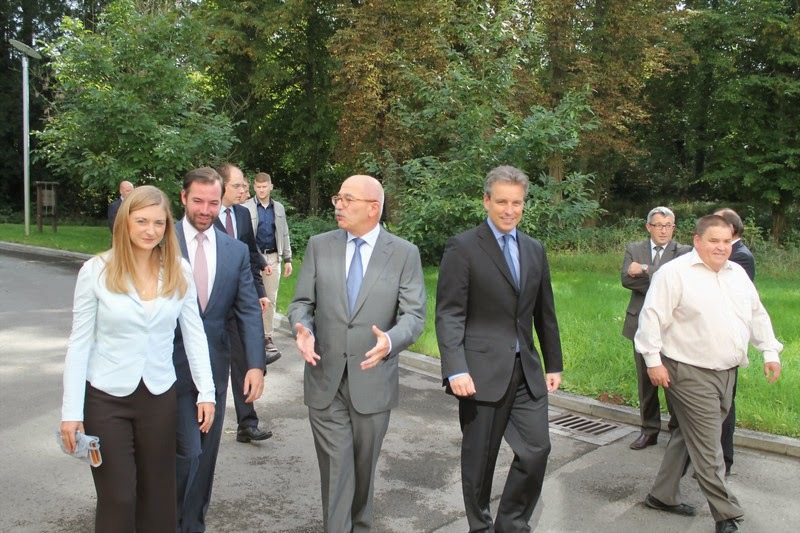 After the day before yesterday's visit to Steinfort, Hereditary Grand Duke Guillaume and Hereditary Grand Duchess Stéphanie paid a visit to the Association EPI in Schrassig yesterday. The Association luxembourgeoise pour l'Encouragement, la Promotion et l'Intégration de jeunes et de jeunes adultes en détresse - basically the Luxembourg association for the encouragement, promotion and social integration of youth and young adults in hardship - is a non-profit organisation which aims to defend the interests of young people in distress and tries to promote their social and professional integration in society. Accompanied by Minister Claude Meisch, the Hereditary Grand Duke and the Hereditary Grand Duchess learned about the different programmes and services offered by the Association EPI during their visit. Subsequently, they also met with a number of teenagers and young adults who have received support by the association in the past. Thus far, there don't seem to be any visuals of the engagement available yet. As always, we will make sure to post links once they do. -- Update: Some are now available on the website of the cour grand-ducale.